Grand opening of the Dirt Factory, June, 2012Each month, the average household in Philadelphia puts more than 200 pounds of trash out for curbside pickup — much of it food waste. Thanks to an innovative food recycling program, residents of University City are working to reduce that amount. 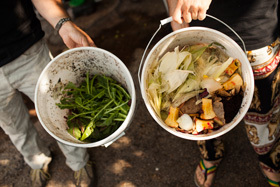 In June of 2012, UCD created the Dirt Factory, transforming a vacant lot into a community composting facility where neighbors can deliver food waste and raked leaves to be transformed into rich, nutritious compost that they can then use for gardens and green spaces. This year, UCD created the University City Food Recycling Project — which aims to further reduce the amount of food residents throw in the trash — and joined the Environmental Protection Agency’s (EPA) Food Recovery Challenge initiative. UCD further expanded its efforts by encouraging University City businesses and institutions to donate excess edible food to Philabundance, a local food bank and hunger-relief organization, helping to feed the hungry and providing businesses a tax deduction. The businesses are encouraged to partner with waste analysis and composting programs like Organic Diversion, Philly Compost or Suburban Waste Services to compost the food waste that is not edible. The EPA estimates that 36 million tons of food waste is generated in the U.S. each year, and 96 percent of it goes into landfills or incinerators. So far, 120 University City households are participating in the composting program, the majority of whom were not composting previously. That is in addition to 150 more that are composting via Bennett Compost. The program has processed about 16 tons of food waste and 34 cubic yards of fallen leaves into compost, generating about 15 cubic yards of compost, most of which has gone to community gardens and community greening projects for growing food in the neighborhood. Learn more about the Food Recovery Challenge at epa.gov/foodrecoverychallenge and the University City Food Recycling Project at universitycity.org/university-city-food-recycling-project. Story byJulianne Mesaric, Photos byRyan Collerd.